Supportive articles for the predictor trader. Potential future developments related to the Market Direction Predictor. World-wide application of the predictor information. A few comments about brokerages. Some of our thoughts about Financial news and their role. The importance of “Let the profits run”. Investing and trading individual stocks and other assets versus investing and trading ETF-s and other index–related asset classes. Let’s start with a comment here. We are striving for excellence an perfection. It has its advantages and disadvantages. It is definitely good for those who will enjoy the benefits of our predictor. When we had the results of the original predictor design, we felt good about the results, but it was not enough for us, even though the results exceeded our initial minimum expectations. So we spent almost the same amount of time, energy and resources, just to get ahead a bit, and increase the success rate of the prediction by about 3 – 5%. Now after many additional improvements we feel we are really close to the potential limit, that the design structure, and the market makes possible at all. One improvement still to develop is related to the impact of the international markets. Obviously we say that many times, how the markets interrelated. For this reason we thought of two options to take this into account when we are using the predictor. Option one to integrate the so-called international market impact into the predictor. But this is not an obvious task, and has advantages and disadvantages. It could help, but it could also mislead the predictor if not working correctly. Those foreign impacts and their effect change dynamically, and highly nonlinear in nature. For these reasons, we currently would prefer the other solution, to calculate the market direction separately for the Asian markets (like China, Japan) and the European markets. But the integration of those markets also has some potential bottlenecks, that must be handled correctly. What would be the advantages having a directional information about the Japan and about the European markets? There would be several advantages. So we try to show only one example. Assume that Yesterday and Today we had a great Up move in the markets, But the predictor gives us Bearish information, that is strong enough to play. We decide to open a Short position. But it could be done two ways. 1. We do not know the probable direction of the Asian and European markets in advance, so we just open the short position before the market close exclusively based on the state of the US stock market. 2. We have the additional predictor data for both the Asian markets and the European markets and both of them point Upward. Now at this point, we know that just because of inter-market relationships, if all the word is going up, the US market might cheer in the open, and might open even up. And that might be a more than a 50% probability. For these reason, we decide to open the short position only after the open of the next day, especially if we see the opening GAP UP and the started decline. Most probably both solution will result in a winning trade, but we saw that numerous times to occur during the year, and profit would have been higher opening the short only after the next day open. The other area that will be important going forward is to complete additional research related to the prediction of index direction that is completely different from the underlying technology used by the system. With those independent results the current predictions might be either confirmed or in some cases questioned. We would used those to adjust the position size accordingly. Even without these developments we believe our predictor is the best on the markets as of Today (Dec. 2009) we know of, even though we see competition, being in similar area as INDEX trading or index-related trading or prediction of future index movements in different time frames. Today the US economy is still the world’s biggest economy and the US stock market has an overwhelming impact on most of the other stock markets of the developed and developing world. Considering the biggest stock markets on the globe we can make some statements. Most of these markets have good correlation with the US stock market movements. This correlation is above average for Canada, UK, and Japan. The least impacted economy through stock market movements is the China stock market from the markets, listed above. Because of this, one of our focus area will be the prediction of the Chinese stock market direction in the future. This would mean that stock traders from these countries could capitalize from our US stock market predictor, especially those, who are playing the longer term time frame, like the swing traders in their countries. Intraday movements might contain more noise and less direct US stock market impact, but on a weekly basis the market turns often happens in synch with major world indices. For these international stock markets the weekly and the monthly US stock market predictor could prove to be helpful, but probably not, if used exclusively, without other tools related to those local stock markets, only as complementary guidance. Some services offer specific brokers as their suggested brokers for their customers. We would never offer any specific broker because the following reasons. Sometime long ago we opened 6 brokerage accounts, because we wanted to see how those brokerages develop their systems, also wanted to utilize and take advantage of one system, if proved better over the other or get different information from different perspectives. 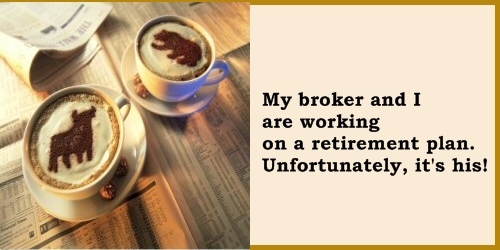 There are expensive, moderately priced, lover priced, and very cheap brokerages. 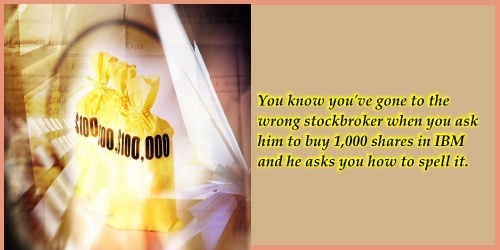 But the fact is that the most reliable, stable brokers are not that cheap brokers. If someone has millions of dollars to invest or trade, does he / she want to put all the money into one single brokerage account? We strongly believe it is not a good solution. As we mentioned, our system uses all stocks on all NASDAQ, NYSE, and AMEX exchanges. So we download the historical data every day, processing it and make millions of other things. Also we have to keep our database system up-to-date. So we have to do ourselves the different database maintenance functionality in the database. We remember this, because it struck us. Since 1999 so in the past 10 years, we deleted over 40 brokerages and financial companies doing brokerage services from our database system. Sure not all got broken. Some of them got acquired by bigger companies, some changed the name / symbol of the company or other things happened. But the fact is, that most of the biggest names (Not all) are still in the industry, as they were 10 years ago. If you pay 2.99$ for a trade and your broker will disappear in two years, then you will probably not be the happy trader. So our conclusion is to read all the broker information, ask experienced traders, consider opening multiple accounts with different brokers, do your research, before you put your capital into any brokerage account. We can’t emphasize how important and valid this statement, that we verified countless time. Actually the news – writers are usually not traders and not economists to predict the consequences of the news. In our view news is only one way to explain to the mass what happened in the markets. Whether the reasoning in the news is valid or not, we can not estimate objectively. Since we are interested in the overnight movements in the market and the pre-market level of the indices and their changes 2 – 3 hours before the opening bell, we sometime compare the news to our predictor signal. Often we see, that market commentator states, that the market Futures point to down or Up, as a consequence of this or that, and the market is about to open below, or above the previous close. If the predictor predicts the opposite direction, we just used to smile a bit 2 – 3 hours before the open and tell to ourselves. Waaaait! We still have 2 – 3 hours before the open! And many times we saw the futures moving in the direction, the predictor predicts, even before the open. It is a good feeling, that no matter what is the news, we have a really objective opinion from the predictor, that is based upon the data, knowledge and zero subjectivism. Of course we check many important pointers before the open in our preparation period, but we are highly selective and sensitive for fact – like news and information potentially impacting money movements, and news that might have subjective leaning. We need mostly the numbers. Because of this we mostly use the bloomberg.com news site to check the schedule of the most important economic data and some other channels. Every trader knows, that basically the news could be classified as positive, if the data is better than the estimates of analysts, negative, if the data is weaker than the expectation, or consensus of the analysts, and neutral, when the data is in line with expectations. Having these three level of news, way too often we saw the market still to go three different ways, no matter what was the news. So for good news, the market still could go Up, Down, or stay in neutral stance, as the market could do the same thing after bad news. So what is the value of the news, than? It has limited value, especially for the very short – term trader, who focuses on the bid-ask conditions of the current second and not much longer. In many cases not only the news is the important, but often more important is the schedule of that news. For a 100 yard sprinter the news that he will hear a shot is not much useful information to win the 100 yard race. What is important for him is WHEN he would hear that shot. So if we know the schedule of the news, we can sharpen our focus on the market, on the reaction of the market, the news itself is unimportant after that. 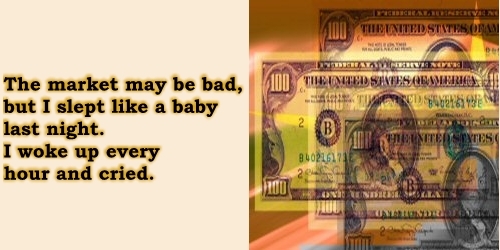 The market will tell, what thinks about the news, whether interpret it as good news or bad news. But no matter if it good or bad, most probably there will be some turbulence in the markets, before the news fully plays itself out. That turbulence could be used by the good traders to generate profit. But we could never estimate with a 100% precision in advance, the way, the market will interpret the news. So our focus should not be the news itself, but the way, the market interpret it. All available investor channels (TV, Radio, Financial papers, Investment forums…) tout the bright possibility to invest some of the savings in the stock market in BIG CAP stable multinationals, so that would produce a nice nest egg when you retire. At the same time US stock markets generally under-perform most known world stock markets by a wide margin. Just in 2006 for example the performance of the US stock market was not even in the first 50 with its 13.6% return in that year, though that was nicely an above average year. On the other side hundreds of thousands of Wall street professionals live like king on those savings and what they actually do to make their living is trading much more often, than they probably did a decade ago. The Hedge fund industry is a clear depiction of the fact, that actually trading is the way for Wall street to enjoy high return in contrast to classical investments, when you park your money in stocks many times for a very long time like 1 – 10 years, and watch what happens. Now since 2000, nothing happened, those, who invested their savings in high CAP stocks, saw their account cut in half (To be a lucky outcome if not having bigger losses after the internet bubble burst out during 2000 or after the 2008 market crash) as the NASDAQ index level currently less than half of the 2000 year level at the end of 2009. In contrast to long-term investments in the US, the trader world is just doing fine. The best traders, enjoy the rewards of their hard work, day in day out, as they play both the up moves and the down moves in the markets. For these traders the predictor is simply invaluable tool, to increase their edge, potentially getting even much higher profits. Because of the importance of trending quantification we present a simple yet very effective indicator, that we developed many years ago and it is used in our systems. The Img1 image above shows a portion of the electrical lines that we see throughout our lands. a bit between the poles, holding them up in the air. The height difference between point “A” and point “B” is basically zero. The next image Img2 shows similar picture, a portion of the electricity lines, but because we had to transfer those line through a mountain, we had to bring up those lines on the hill. In this case the height between point “A” and point “B” is H, the height of the mountain. The next image, by which we would like to demonstrate our starting model is on Img3. This shows a bit more information, compared to Img2. Assume that at the time of the implementation of this electrical network portion the wire not fixed on each pole, so the wire can move a bit up / down. To bring the wires Up to the height of the mountain we need to use F force. This F force vector has a horizontal and vertical component, and we can imagine, that the bigger the F force used to keep the wires in the air, the smaller the “h” hanging height that we get between those poles. Now we show a trending stock chart and we try to find similarities between the Img3 and the following image presented on Img4. - The higher the force, that is used to pull the market in a directional way (In this case upward) the bigger the directional movement in the stock or any asset. We know that in case of the market this force is actually the current demand-supply imbalance that moves the market in a directional way. - The stock or other asset experiences pullbacks, which could be considered normal situations even in a trending market. - The bigger the pullback between the local maximums, the less difference we have between the supply and the demand. Having a bigger force, or bigger difference between the demand and the supply in a way, that demand is bigger, the smaller these pullbacks will be, and similarly the “h” hanging height will be smaller in case of bigger applied force at the top of the hill at point “B”. be smaller in case of bigger force and vice versa. Similarly if the force (Demand – Supply imbalance) is big, the Total length, Total movements within the stock between points “A” and points “B” will be smaller, compared to the cases, when the force is smaller. - We would like to have the capacity to compare many different stocks and other asset classes in terms of trending strength, and to do that we need to eliminate the price data and need to use relative performance or price-changes in percentages during those movements. As a next step we try to calculate the Total length of the cable, the total movement in the stock / asset. What is physical distance in case of the electrical wires, it is time in case of a stock chart. We have the bars / candles for a specific time frame that we use as bracketing conditions. The Sum in this case means that we add together the absolute differences between the closing price and the opening price within a bar / candle / selected time unit. In the denominator we sum the body of all bars / candles between point “A” and point “B”. We can also use the SUM(ABS(Pmax –Pmin)), the total differences between the Maximum and Minimum price levels within each bar / candle / time unit in our calculation of the total movement within the asset we are using in the trend quantification process. But no matter we use the SUM(ABS(Pmax –Pmin)), or the SUM(ABS(Pclose –Popen)) during the calculations we need to verify, that the denominator is greater than zero, otherwise we would get overflow calculating the JPTES. SUM(ABS(Pclose –Popen)), than the calculated JPTES could get bigger than one in special situations, even if most of the time it would stay below the value of one. Having JPTES for any stock or other asset class using the same time-frame for all stocks we can quickly get measures about trending. Within a split second we can sort these trending measurement data by computer using a sorting algorithm and get any number of stocks and other assets sorted according to trending, be that up-trending or down-trending. The better the trending the bigger the value of the JPTES indicator. As the opposite of the trending market is the range market. The JPTES can also be used to help differentiating between trending markets and range markets. In our system we added further tuning, improvements to this simple indicator to filter out some noisy behavior, that appeared on less than 5% of the charts. ordered by trending strength, measured by JPTE. We also added the automatic time frame selection to use in the calculations, in case if we just specify the time difference between point “A” and point “B”. Than we can watch all the best trending charts and might focus our trading efforts around the most promising equities. Though we need to note that the best risk / reward trades might not necessarily come from the best trending assets. We can’t compare different asset classes on different time frames as our numbers are not normalized in the present form. But we can compare asset classes on the same time frame. It should not be an issue as we do not want to compare for example the trending charts of 1 minute time frame to trending charts of the hourly, daily, weekly time frames. To do that we need to tweak the indicator a bit further. Many traders hear this slogan too often and still not getting the crucial importance of this for the final results that might be reached during a trading period, for example one year. So we try to demonstrate this by some very simple calculations. To support our demonstration we present the following hypothetical chart for one day. 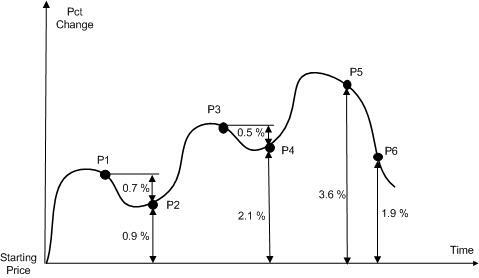 On the horizontal axis is the time and on the vertical axis is the percentage move in the asset in question. We marked six points P1, P2, P3, P4, P5 and P6 on the chart that we plan to use as trading points. Assume that six traders trading, using the predictor information. The predictor has a Bullish prediction for the next day, and the asset opens at the same level, where it closed the previous day. All six players have a 100% Long position overnight, allocated to the trading of the asset in question. 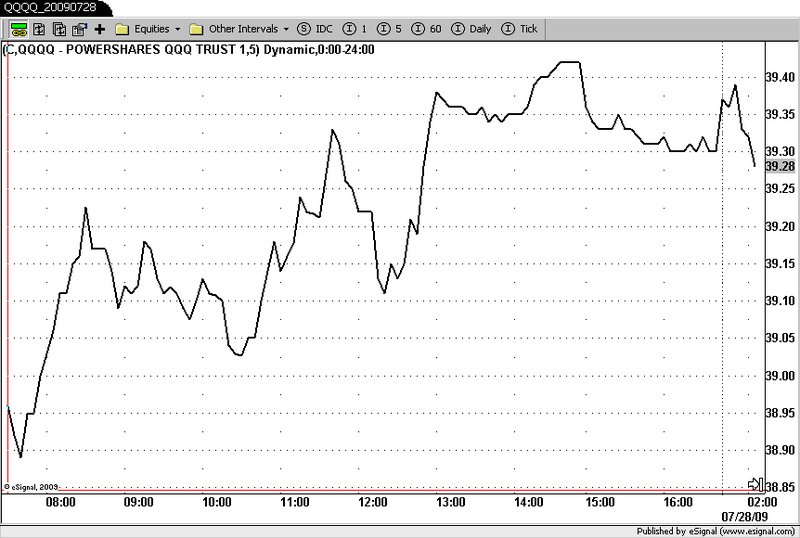 The six traders will react to the intraday development differently. All six players finished the trading day with a profit, but the differences between the results are noticeable, especially if we take into account the compounding effect during the days for a year, the difference between these trading results are very big. The first player did not want to risk the winning position and closed way too early, without even thinking about possible trading range for the day and possible higher prices. A big improvement occurred between the results of trader #1 and trader #2 just because the second trader was willing to let the profit run a bit further, knowing that trends usually do not end so soon without a few normal pullbacks down the road. The trader #4 was even better, because he delayed closing part of the overnight position at the first time of weakness, and waited more selling the first portion only after the second local top. Again a big potential improvement could be seen if a trader get more aggressive, and not only focuses on closing the position, but also to open another position if see continued strength in the market throughout the day. trader # 6 was extremely aggressive, using even some margin funds to complete his trades during the day when saw the convincing and continuing strength. As always bigger profit rarely comes without bigger risk. We note that these are only for demonstrational purposes, the actual points of trades might be different. The percentage of moves demonstrated above are normal everyday moves in the ultra index ETFs (Exchange Traded Funds) which moves two percent in case the underlying index moves one percent. For the sake of simplicity no slippage or commission calculated into the results. This example also demonstrates that the difference between the users of the predictor information might be considerable, based on the strategy built around the predictor. When we evaluate a potential investment and trade entry we must have our objective and our risk tolerance defined and laid down in front of us. We would like to present some data, that the majority of the market players probably not taking into account in the asset class selection process. No question, individual stock and related investments often have bigger reward potentials as well as risk potentials, but even this issue is getting addressed by the creators of the leveraged index-related instruments. The media would like to assure you that your investments are good if you invest in the US stock market buying individual stocks and in the long term you definitely be better off as your net worth will increase during the long span. For the sake of simplicity we take one investor, who invests 100K in four different stocks (As diversification is so important.) with the objective to have a good retirement balance sheet within 10-20 years. Yes the investor can select the higher risk Low Cap companies, that did not get noticed by the media, can select a bit more stable Midcap companies with more established income stream, or the much less volatile, but more stable Bigcap or Hugecap companies. Assuming that our player selected the companies from the medium risk Midcap companies, which belongs to the S&P400 index so that they at least known for some time. We mentioned that we have our own database system that we maintain to deliver the predictions. Just the past 12 month from Sept. 2008 till Sept. 2009 we deleted more than 50 companies from the S&P400 index components. Yes not all of those companies got bankrupt, some got acquired or just could not reach the requirement level to stay listed within the index. The S&P600 not better either. Within the last 18 month period till Sept 2009, we deleted 140 companies from the index, a whopping 23% of all companies. It was a bit surprising to see, that most of the newly listed companies in the 140 replacements came from financial services companies and banks, amid the biggest financial crisis in the previous 80 years. Yes, not all, but still a huge number of companies lose all of their values within a relatively short period of time. So while the index itself does not get down, when a specific weak or bankrupt company gets replaced by a stronger growing company, the individual account might lose a big percentage of its value, if one out of four investments get eliminated by losing 100% of its value. The probability that by investing in four Midcap companies over longer period and one of those investments will lose 100% of its value within 5 years, is very high, simply does not worth the risk to take at all. We would estimate that any individual, who diversify and have only four companies in his portfolio, taking way too much risk, compared to investments in ETF-s or index – related asset classes. To decrease the risk to acceptable levels we need to diversify into 10 – 20 individual companies or more that many individual investor fails to take or simply doesn’t do. The funds can diversify into hundreds of companies, decreasing the potential loss with bankruptcies to negligible levels. If you think that you are much better off by selecting the biggest names, we also mention that during the past 10 month period till Sept of 2009. eleven companies got de-listed from the NASDAQ100 index and got replaced by better, stronger companies. That is 11% of the index companies within a 10 month period. And most of them did not get out because of extreme strength or acquisitions. Many player confuse the stability of the market with the stability of the individual companies. As of Sept. 2009 for example the average listing period of any company on the NASDAQ was about 7 years. Of course, we also have the oldies, Microsoft, Intel, Cisco, Apple… there, but must of the companies got listed on the NASDAQ exchange after 2000. To take all these into account you better not to count on any company staying in the index or even listed for 15-20 years, as those are the real exceptions. And the risk is even bigger during the first 1 – 3 years after getting listed in the index. Some companies just go to the market, get the funds from the public and than disappear within a short time. We learned to be extremely careful with individual companies the hard way. It was one of our positions, a big internet service provider with international networks that just disappeared overnight. That was almost 10 years ago. You should not learn the hard way. Since than we rarely hold any individual company stock overnight. For intraday trading it might be OK, but any company can disappear overnight. ANY. You name it and you get it. of companies disappeared from indices. But you usually hear only the biggest names in the news. For very long term investors if we compare the indices and the individual stocks the situation is not favoring the individual stock investor either. For example if we pick any date during the previous 100 year period, no matter which date we select, the stock indices were higher after a 20 year period (Even 20 years after the 1929 depression.) But if we check the value of individual stocks 20 years later, the results not really good. Considering the NASDAQ index, less than 30% of all companies that were listed in 1989 still in the NASDAQ today. In order to stay consistently successful in the long term individual stock playing field someone also need to have pretty good fundamental analysis skills to be able to decrease the inherent risks, involved. Because of these we would prefer the investments in different kind of ETF’s and other Sector, Region or Index –related asset classes. Those ETF’s can also disappear, and has their risk, but not the kind of risk, that we would have in case of individual companies, especially if we have only a small number of those to diversify into. You worked hard to save those funds and would like that to work for you and not to bother you during the longer time frame. So we kindly suggest to take these into account when you select the asset classes to express your opinion on the market. Finally for those who would accept to take bigger risks from leveraged ETF-s. The Ultra ETF funds are designed to be used for short to mid term periods in the market. Those producing 2% movement or 3% movement in the Ultra ETF in case the underlying index or other asset moves 1%. But these instruments does not necessarily move 2% or 3% if the time period in question is much longer than 1-3 month. They might move nothing in these cases or much less than a linear relationship would produce. So these are not designed to be used by long term investors. Another simple tool that might be very useful in certain situations is the idea of an MA turn calculator. on the direction of some averages. average. Less often used similar averages are the weekly MA50, MA100. MA200 averages. is also very important for the retail investor. out of the stock market, depending on the direction of the turn. When does the MA200 will turn, that is the question. Take the 2009 summer situation for example. MA200 need to move 1 - 1.5% from the bottom / top. So the direction of the market and the direction of the MA200 need to be different. That is a rough criteria. slopes or when the market doesn't move, but stay well above / below the MA200 for a prolonged period. for both the MA200 and for the market indices. while the markets moved upward briskly. by inserting 1...N days into the data, as if the market moves forward. index level stays the same. When we used our simple tool we tested many possible scenarios in advance. We tested, how many days needed to turn the 200 day MA upward, If the index moves Up 1,2,3,4.. percent. us at that time. Calculations could be refined on a daily or weekly basis as time passes. dynamically upward in the following weeks after the MA200 turn. just before the MA200 turn upward during July 2009. MA50…) into the future to add the closing values automatically when calculating MA200 index turn. You need to ask the good questions, and design the solution according to the needs. With some additional modification a tool like that can also be implemented on other time-frames.